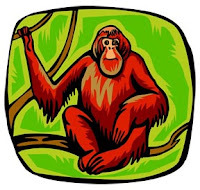 If I could ever create my own TV show, it would be called The Detectapes and it would tell the story of a detective agency run by three orangutans. The first orangutan would be named Louis and he would be the computer whiz. What Louis lacked in social skills would be compensated by his ability to hack any program and build all sorts of electronic gadgets to help the other Detectapes in their exploits. The second orangutan would be Trent, the charismatic one. Although he wouldn’t be exceptionally smart and tend to become distracted by women, his ability to manipulate people with his suave demeanor would prove to be very useful. The last Detectape would be Malcolm, their fearless leader. Malcolm wouldn’t seem to have any special skills at first, but over time it would become apparent that Louis and Trent were helplessly unfocused without him. And Malcolm’s keen wit and ability to link clues would never fail to impress viewers. The Detectapes would have their own German butler named Fritz, and he would attend to their every need. And they would all wear roller skates all the time—not the new inline skates like rollerblades, but the old-fashioned quad skates with the really thick wheels. Wealthy Mrs. Benson screams loudly one morning upon discovering all her expensive jewels stolen from her wall safe and her husband’s dead body on the floor. After the initial police investigation shows no leads, one of Mrs. Benson’s maids gives her a business card for the Detectapes and tells her that if anyone can find the culprit, it’s the dynamic trio. At the Detectapes office, Louis is playing with a computer mouse, Trent is asleep at his desk and Malcolm is hanging from the office tire swing. When the phone rings, everyone is brought to attention. When he hangs up the phone, Fritz picks up a hammer and hits the large gong in the office to signify they have a new job. All of the Detectapes go wild with excitement. Trent bounces up and down and swings from the ceiling lamps. Louis rips the telephone out of the wall and smashes it against the floor. He then does the same thing with his computer monitor and the fax machine. Malcolm jumps onto Fritz and beats him within an inch of his life. The butler is only saved when animal control shows up and shoots all of the Detectapes with tranquilizer darts. Orangutans are like that. They’re very ferocious animals with incredible strength and they belong in the wild. If you place them in a civilized atmosphere and expect them to behave like humans then you're only creating trouble. And putting roller skates on them is just sick animal cruelty. They should be roaming free in a jungle, not suffering for cheap entertainment. In the end, the Detectapes will prove that Mrs. Benson’s own sister stole the jewels to pay off her gambling debts, and she impulsively killed the husband when he showed up during the heist. They were tipped off by a suspicious email Louis found after hacking her computer. Malcolm sealed her fate when he noticed traces of her very distinct perfume still odorous inside the wall safe. Once again, the orangutans saved the day, but not without considerable property damage.